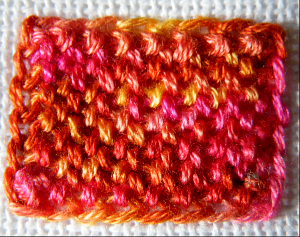 Variation 3 uses twisted chain stitch and is worked from the bottom to the top. 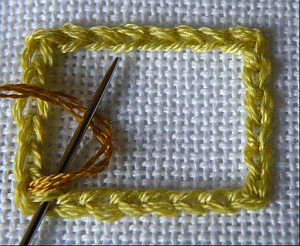 Start by bringing the thread through the lowest chain on the left-hand side. 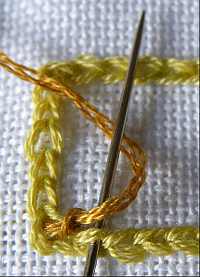 Insert the needle under the upper loop of the first chain of the lower edge, and pass the thread around the needle as shown. 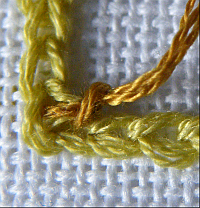 Pull the thread gently upwards to form the first knot. 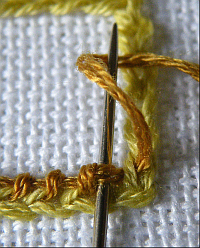 Insert the needle under the upper loop of the second chain and make another knot. Continue along the row until you have seven knots. 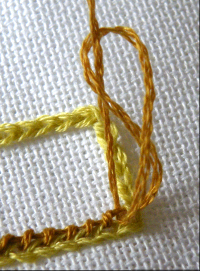 Insert the needle under the inner loop of the lowest chain of the right-hand edge and bring the needle through to start row two. Pick up the bar between the last knot of the previous row and the edge chain. 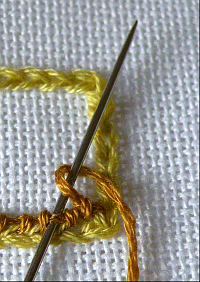 Pass the thread around the needle as shown. 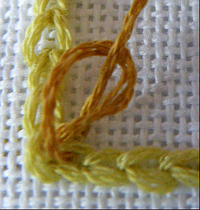 Pull the thread gently upwards to form the knot. 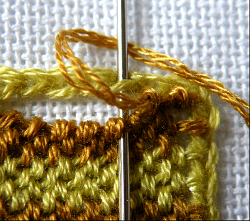 After the seventh stitch, pick up the inner loop of the next chain on the left-hand edge, and bring the thread through to start row three. 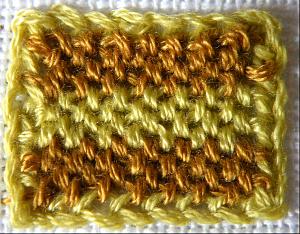 Row three is worked using the same stitch as the first row. 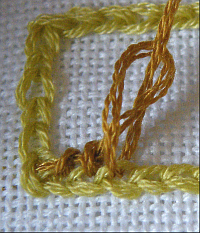 Work the first stitch into the bar between the edge chain and the last knot of the previous row, work the next six stitches between the knots of the previous row. At the end of the row, pick up the inner loop of the next chain on the right-hand edge, and bring the thread through to start row four. Continue working even-numbered rows as row two and odd-numbered rows as row three, until the start of row twelve. 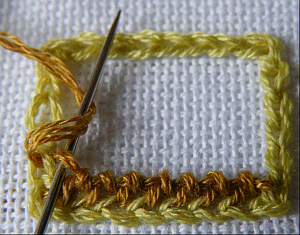 Rpw twelve: pick up the bar between the last knot of the previous row and the edge chain, and then pick up the inner loop of the first chain of the top edge. 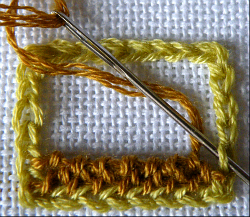 Make the stitch as normal. 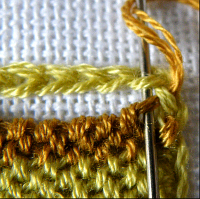 Continue along the row, each time picking up the bar and a loop of chain before working the stitch. After the seventh knot, take the thread to the back and fasten off.